Just like a bird that has swallowed a plate? I was recently looking for a book about Tudor Portraits and came across this book by Maurice Howard. The book doesn’t just cover portraits, there are references to items such as engravings, tapestry and funeral monuments. The author points out that the Tudor period saw an explosion in the production and use of artistic imagery. Some things were designed for private contemplation, for example the portrait minature (see this wonderful Blog for more about this). However, many other items seem to have been designed to display wealth and power. Looking through collections of artwork one gets an idea of the competition to acquire the the most elaborate and decorative items. It is suprising how many portraits include subjects wearing – or quite frequently just holding gloves. 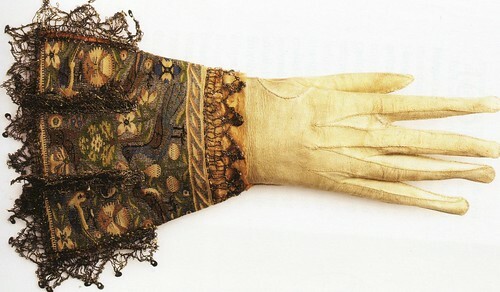 Many of these are very highly decorated and are elongated into lace and pearl covered gauntlets. It seems hard to imagine that it would have been practical (or even possible?) to wear some of these pairs of gloves. In his biography of Shakespeare, Anthony Holden discusses the playwrights father John who was known to have been a glover. After soaking the hides of deer, goats and sheep he would make the leather into gloves as well as other items such as belts and purses. Over elaborate & a bit odd? Of course, Stratford was a rural provincial backwater and it seems unlikely that John Shakespeare would have been turning out anything as elaborate as items being produced for use in London. As well as gloves, there are over-decorated shoes, sleeves, hats and of course the ruff. Look at this image from 1613 of the 3rd Earl of Dorset, Richard Sackville. 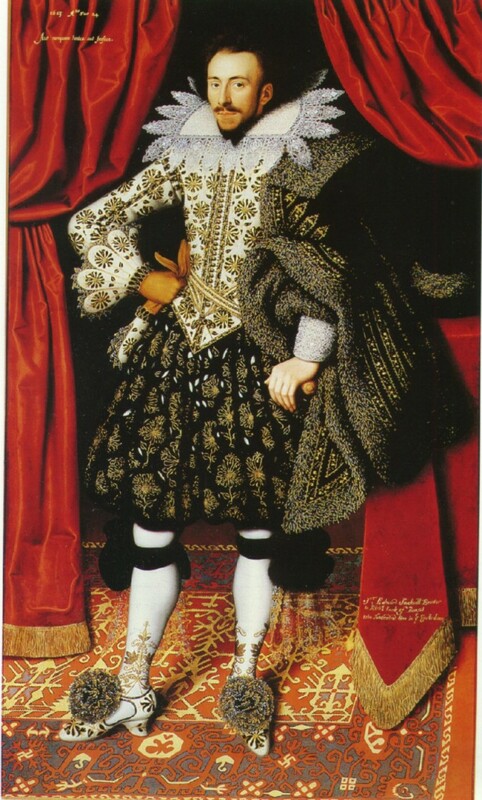 No doubt the Earl dressed in his very finest clothes for the portrait. 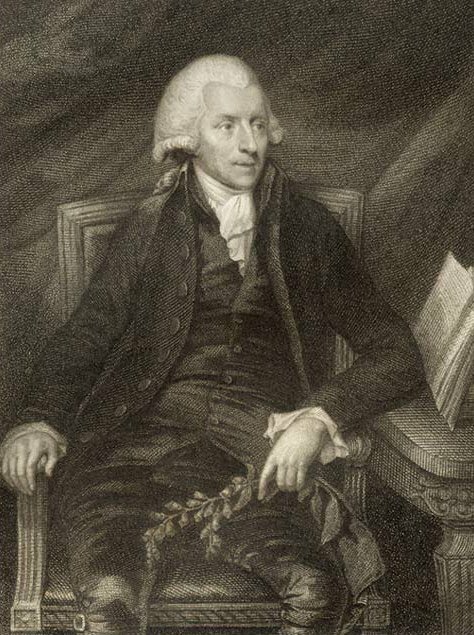 Clearly, the fashion for elaboration had continued to develop long after John Shakespeares day. The Saltonstall Family 1636-37. Odd and just a little disturbing – what was he thinking of? Look at this picture by David des Granges of the Saltonstall family. This painting is a family record which shows Sir Richard Saltonstall with his new wife and baby (seated) as well as his two children from his first marriage. It has been suggested that the children are painted as they were at the time of their mothers death. The dead mother is lying in bed behind them all – her husband is vaguely waving his gloves in her direction. Can you imagine how such a picture would be recieved today? – it would be quite easy to make this sort of thing in photoshop. Surely this is one of the oddest pictures ever? Would you want it on your wall? Is it just me, but..
Not for the first time when looking at Tudor images I find myself thinking how, well – odd it all looks. The Tudors really had a very different idea about what looked good – to modern eyes it all looks a little strange. Don’t you think that the Earl above looks just a little ridiculous? For me, the best expression of this came in this episode of Blackadder – have a look at this and ask yourself what Blackadder would have said about the Earl. What do you think? Comments as ever are really welcome. 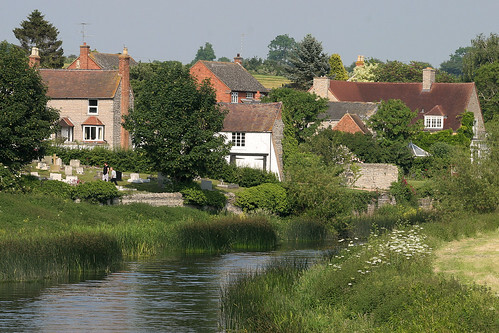 Not far from where I live is a place called Bidford, a lovely old village on the banks of the river Avon in rural Warwickshire. 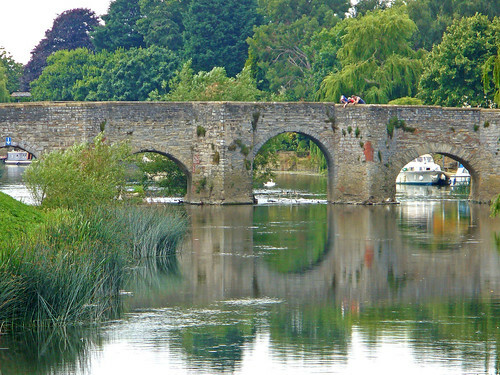 We used to go there with our parents to eat picnics by the river bank and play in the meadow by the river and I have been there with my own kids to do the same. Now that spring is here and the days are getting longer and warmer it is time to start getting out and about – I love the idea that we are so often following the same paths that our ancestors explored before us. 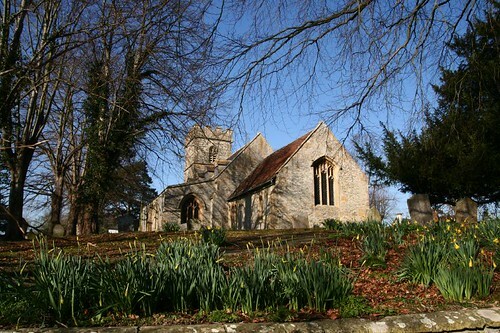 There is a story that Bidford was famous for it’s beer drinkers and that one day a group from Stratford came to the village and started drinking with the locals. Amongst the Stratford visitors was a young man called Shakespeare who tried and failed to out drink the Bidford men. Beggarly Broom and drunken Bidford. If you have never visited any of these places then I can recommend you try to look them out one day – although try to avoid drinking too much in Bidford! PS. Whilst I am on the subject of Tudor era booze ups – is this a good excuse to look at this clip from Blackadder?